They look and taste somewhat like sidewalk chalk. Put one in your mouth and you might think at first that it’s antacid medicine. The flavors, including strawberry vanilla and a sweet coffee taste called “Caffé Latte,” are unexpected and yet, in the right scenario, surprisingly good. 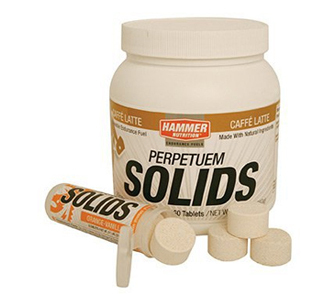 Hammer Nutrition’s Perpetuem Solids are among the strangest energy food I have yet to try. The dry pellets, which contain the same ingredients as found in the company’s popular Perpetuem drink powder, have just 33 calories a pop. Eat three of the Solids and you get 100 calories — about the same caloric energy as is had from a gel pack like GU or Clif’s SHOT. But the taste, and the tactile experience on the tongue, is wildly different from sweet, sticky energy goo. I ate a few packs of Perpetuem Solids while competing in the week-long Wenger Patagonian Expedition Race last month. The Solids come in tubes with six tablets stacked inside. The cost is $3.95 for the tube or they come in a 90-count jar for $36.95. Flavors in total are Caffé Latte, Orange-Vanilla, and Strawberry-Vanilla. In an endurance race or for long training days, the Solids can be a nice alternative to energy bars. They are not really a replacement to gels, however. Don’t use them on sprint races or when you need quick energy — the Solids are sustenance for endurance sports and long days, with adventure races, fast mountain climbs, and Ironman triathlons included. Nutritionally, Hammer promises “consistent, stable energy” from the Solids, which have the aforementioned 100 calories and 0.9 grams of fat per each serving of three tablets. There are 3 grams of protein, 20 grams of carbs, and 3 grams of sugars in a serving. In its marketing literature, Hammer touts that the “search for a convenient, yet high-quality, solid fuel source is over” now that the Solids are around. This is an exaggeration, to be sure. You could only eat so many of the Solids before your stomach would be full and weird. Indeed, don’t forget to drink when you’re downing Solids. The chalky substance can coat your teeth and throat. Overall, the Solids are a nice, if a bit strange, addition to a stock of energy food. The chalky, crunchy taste of the Solids — and the unique flavors — were strangely satisfying after days in the wilderness eating sugary bars and energy gels. In the wilds of Patagonia, deep into a big event where we ate upwards of 6,000 calories a day, the Solids offered a new taste sensation and a nice break from the monotony of always eating the same thing. —Stephen Regenold is founder of Gear Junkie. Read more on Team GJ’s experience in the Wenger Patagonian Expedition Race at GearJunkie.com/Patagonian-Race.